I've skipped 10! count them! 10 days. 1. Blocked the Crown Prince Shawl. I probably bought the yarn for this almost exactly a year ago. 2. Got very angry about pastors making excuses for male God language. 3. Started knitting a dead fish hat. 4. Watched some West Wing. 6. Got some hot chocolate, and was joined by Amoeba. Calmed down after the quasi-accident. 7. Learned how to defend myself against children hitting, kicking, choking or biting me, or pulling my hair at Nonviolent Crisis Intervention Training. One of my coworkers decided to quiz me on these new defense skills whenever he feels like it. 8. Went to knitting circle! For the first time in, like, a month. Dead fish hat, go! 13. Saw my high school choir director on TV. He was singing in the Univ. of Arizona choir that sang at the memorial. 14. Watched more West Wing, including a very sad episode. 16. Went to Drunken Knit Night and continued efforts to accustom my taste buds to coffee by drinking Guinness. 17. Cleaned out my inbox. So much more satisfying that cleaning real things. 18. Had lunch with Anna! Food = meh. Company = the best. 19. Made a mental note to self: Someday, make a (maybe punk?) concept album based on the Federalist Papers. 20. Talked to Cory! Walk = cold. Company = the best. And Hooray! for not getting lost while walking around my neighborhood on the phone. Small victories. What do sheep do on sunny days? Have a baa-baa-cue! Why couldn't the skeleton go to the dance? He had no body to go with! Where do aliens keep their sandwiches? In a launch box! How much do pirates pay for their earrings? A buccaneer! Peter's joke: What's the best thing to come out of Iowa? I-35. 3. Coffee and knitting date with the Amoeba! By which I mean, I drank some hot chocolate. Also, Amoeba is working on her first sock! 4. Turns out the second, third, and fourth graders in the afternoon didn't think the jokes were that funny either. 5. Modern Family and sock finishing. Amoeba has since turned her heel and is almost at the toe! 1. I woke up feeling absolutely awful about my life and my identity and having to get out of bed and deal with the world. Then I realized I was actually just cranky because I was really hungry. 2. Nonviolent Crisis Intervention training: part one! It was okay, and somehow, half of it was about classroom management. What's that? You only got three and half hours of sleep? Drink a liter of something caffeinated. 3. Wandered around Borders and read for a while. 4. Day one of Central Park Winter TOPS was approximately 27x better than CP Fall TOPS day one. As long as we continue to have enough staff, this is going to be so much better than the fall. 5. Decided to skip knitting circle, because of the 3.5 hrs of sleep. Plan: eat, check email, do some brain puzzles, read, drink a beer, and go to sleep. Reality: eat, open a beer, fall asleep. 1. Not only did we play Monopoly, Jr. today at the before-school program, we also played "The Rules are Missing, I Guess We'll Have to Infer Them". When I'm wearing a plaid green shirt and a scarf that obscures my neck, I think I look like Filbert from Rocko's Modern Life. 4. The after-school program wasn't starting until Tuesday, and so we had Giant Information Meeting of Overwhelming instead. Including the fun realizations that (1) there is no scheduled gym time for 3rd graders, which is Not Okay and (2) the 2-6 graders don't have anywhere to put their backpacks and coats. 5. Dinner at Dino's Gyros, which I do not visit frequently enough. Ate the hummus wrap, and some pita chips and feisty feta. The food was eaten concurrently with journaling and looking over my songwriting book, both of which need to happen far more frequently than they do. 2. Finished reading Gender Outlaws: TNG. 3. Hung out with relatives in celebration of my aunt's birthday, which was Dec 31. Pizza, cake. Her new porch has a heated floor. 4. When she was in 7th grade, my aunt did a report on the USSR and wrote to the Soviet embassy for information. This is the propaganda they sent her, from 1973. 5. The rest of the evening will be spent starting a book by Max Wolf Valerio, and working on that sock. 3. Several episodes of NCIS and SVU accompanied the knitting of the Devon socks from Cookie A's Sock Innovation. Yarn: Malabrigo Sock in Botticelli Red (a gift from the lovely kirinlemon, who is back in the country!). Knit the heel flap, heel, gusset, and some foot. Such progress! 4. My mother made me what might have been the most delicious grilled cheese sandwich I have ever eaten. 5. West Wing, with my dad. (Episodes: Ellie, and Somebody's Going to Emergency, Somebody's Going to Jail.) I freaking love this show. Overanalyzing the Crayola 64 with the Amoeba. So, starting around the time of the release of the seventh Harry Potter film, I've been dating this really great person. We have traveled very different roads in the last several years of our lives, but are in quite a compatible place right now. It's pretty exciting, and pretty fun. We shall call her the Amoeba (because of this post on her blog). So, because we're both incredibly nerdy people, we overanalyzed her box of crayons. 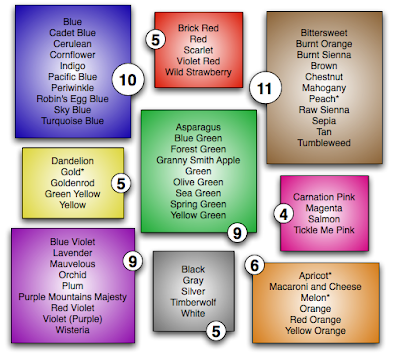 We looked at crayon names and overall color distribution. Following is our data, and conclusions. - Orange is not an adjective. - Stoplights (red, yellow and green) are very adjectival. Then we decided to look at how many crayons there were in each color group. We predicted a lot of browns, and that shades of red and pink, when added together, would have the highest count of any color group. Here's how they all look when parceled out. 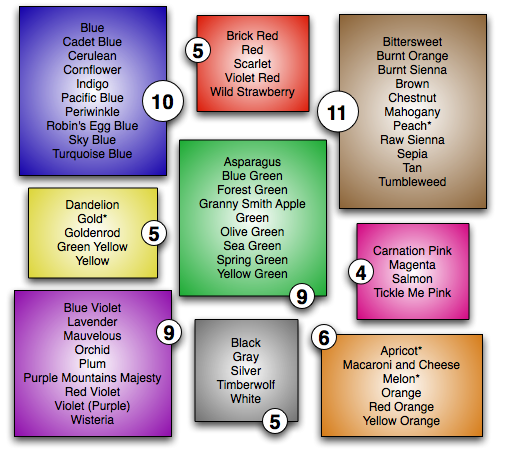 Asterisks indicate colors whose placement could easily be disputed. -There were not as many reds and pinks as we expected. 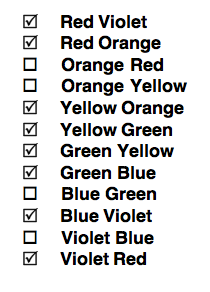 -Orange is the most ambiguous color group. We filed two questionable colors under it, and Burnt Orange is not an orange. -Carnation Pink and Tickle Me Pink are not different enough to necessitate two crayons. -We're short on yellow choices. -The cooler shades clearly have the most interesting names. -Do there really need to be that many browns? Are we going for a range of possible skin tones via arboreal references? Or are there just a lot of browns? -Purple Mountains Majesty is the best name. Followed closely by Mauvelous. -Peach is not peach-colored. It's kind of the color of peach ice cream, but not peaches. -There's a lot of food going on (I count 10, excluding Orange); this is especially true in the greens and oranges (3 foods each). What are your conclusions and queries? A conclusion from Linden: Had I thought of this while still at Oberlin, I totally could have done an expanded version and probably used it to fulfill the quantitative proficiency requirement.